31-May-2005 -- We were on our way to visit a friend in the town of Diébougou, Burkina Faso. We decided to take a side trip, of course, to try and visit a nearby confluence point. The road map showed this point to be not terribly far from our destination. After leaving Houndé where we spent the night, we took the road south from Pa. The road came to a dead end with the confluence point almost due east about 13 kilometers away. We drove into Dissin trying to find a path, which would take us a bit closer to the point. Not finding a suitable path, we turned around and drove until we were about due south of the point. We locked the 4-wheel drive hubs on the truck and went in search of the point. Driving down some donkey cart paths for a bit, we were able to get within 4.3 km of the point. It wasn't too hot and we were up for a good cardio-vascular workout. Leaving from the truck with water, camera and GPS, we were ready! It had rained just a few days earlier and we found many farmers and families out in their fields planting or hoeing. It was fun to greet everyone as we walked by the fields, but quite difficult to explain what we were doing or where we were going... "Over there" was the simplest explanation, which seemed to work. Our only 'obstacle' was climbing a hill for a few hundred feet; the confluence point was up on top. At 9:35 a.m., we were taking pictures of 11N 3W. However, from the pictures, you can't tell that we were on a hilltop. 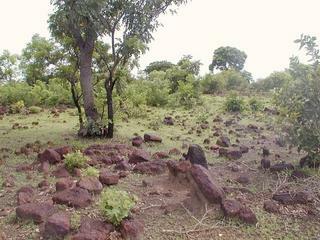 The panoramic picture is taken 100 meters east of the confluence point. Again, you can't tell we're on a hill, but we thought the view was worth sharing. It took a little over an hour to get back to the truck. And we even made it to our friend's house in time for lunch! #3: Southern view, with us in it! #5: Shot of the GPS. #6: Here's the panoramic view a bit to the east of the point.